and reversible.The Nautilus® T916 Treadmills use the patented REACT®absorption control technology, which protects the user’s ankles,knees, hips, and back by providing the most advanced and most dynamic cushioning system available. Some of your members will the treadmill to walk, others to jog, and still others to run.Whatever their pace, their stride, or their incline, the REACT® system will adjust automatically, so the surface will never be too hard, and never too soft. The Nautilus® T916 treadmill offers a generous 22”W (56 cm)by 63”L (160 cm) working surface, which is the longest effective working area of any treadmill in today’s market! 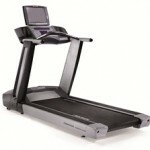 63” bed length, 22” belt width…the longest effective working area of any treadmill today! 88” L x 35” W, Machine Weight: 370 lbs.